Join the party in Aspen! 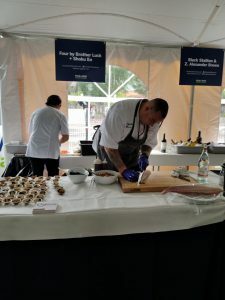 This premier culinary event consisted of three incredible days of cooking demonstrations, wine tastings and panel discussions by world-class chefs and wine experts. 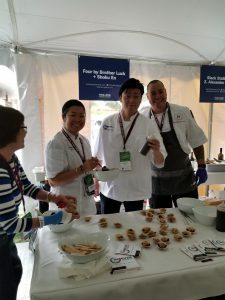 Shoku En partnered together with Top Chef Brother Luck (Bravo Season 15) and his restaurant, Four By Brother Luck, to introduce the Buri and provide tastings for over 2500 people over the course of the 3 day show. 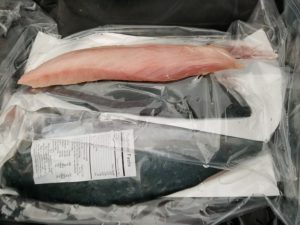 Fabulously received, we had numerous questions on where to get the Buri and to get an idea of how the American palate would react to this relatively new, sustainably raised fish. We look forward to participating again in 2019 and actually being able to provide distribution and retail options. 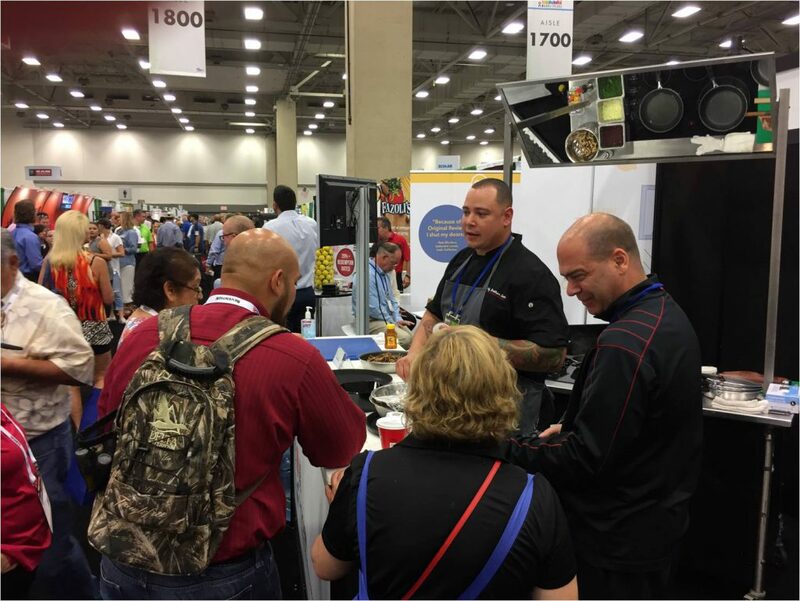 TRA Marketplace is the Texas Restaurant Association’s annual restaurant and foodservice show. The largest of its kind in the Southwest, it is backed by TRA’s 80 years of industry leadership, and is as bold, unique and packed with opportunity as the Lone Star state itself. Now in its 80th year, the TRA Marketplace dazzles visitors with stunning and interactive display s, state of the science products and equipment, cutting edge technology and the very latest news, trends and advice from dynamic industry leaders. 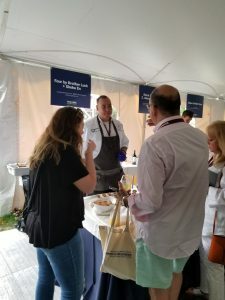 Thousands of restaurateurs, chefs, and industry executives attend over the two-day period and over 500 exhibitors participate, showcasing everything from artisan food products and craft beverages to linens, mobile technology, security, kitchen equipment, supplies and much more. 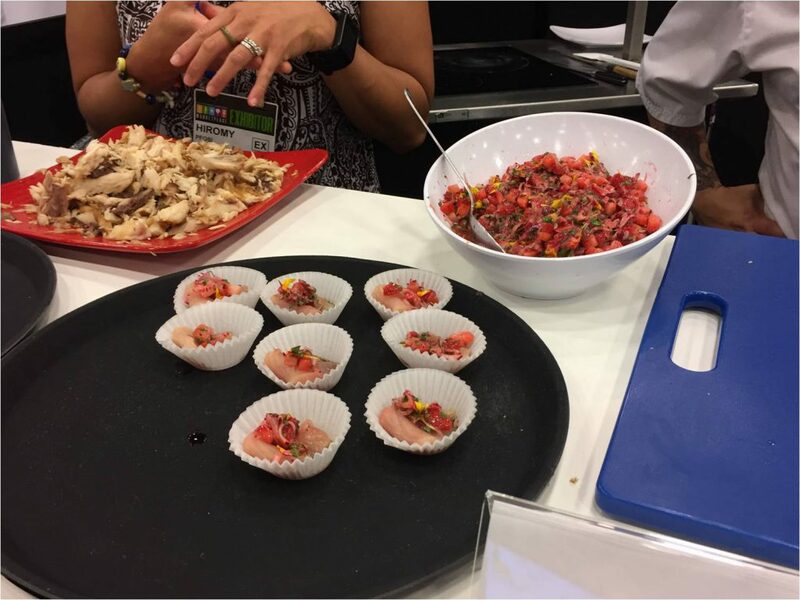 Part trade show and part conference, the TRA Marketplace motivates and inspires everyone – from first time restaurateurs to industry veterans. Engaging seminars and interactive panels are offered by industry thought-leaders on trending topics and specialty pavilions offer an exciting, diverse and valuable glimpse into the latest products and services that the market has to offer. 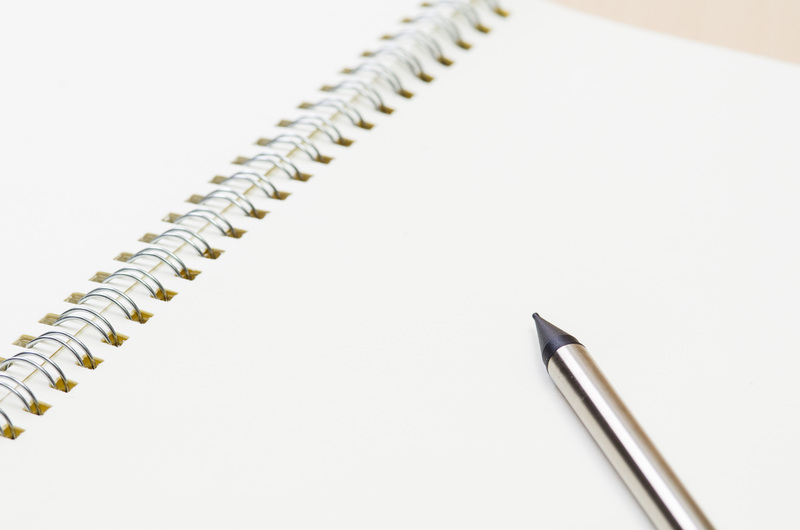 Many nationwide consumer and industry trends have their roots right here in the Texas market. 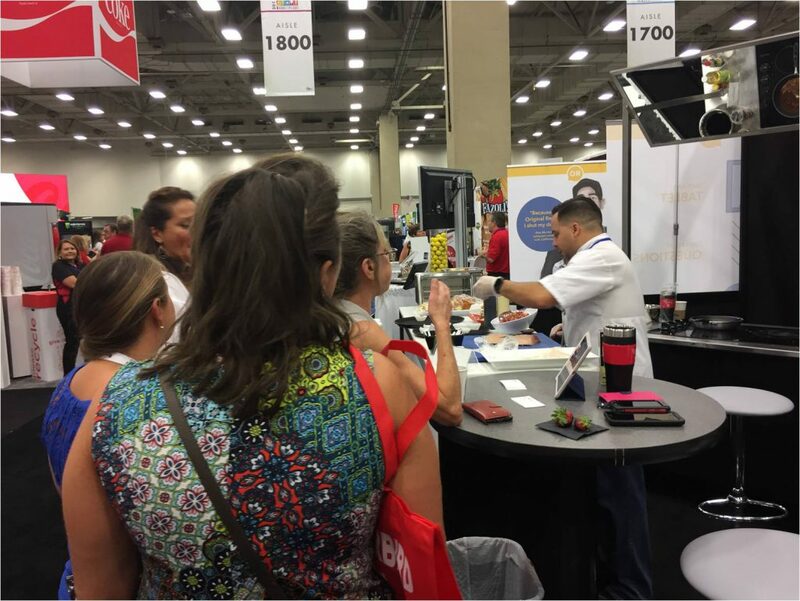 The TRA Marketplace provides attendees a chance to meet face to face with industry leaders, discover innovative products and practical tools, make valuable connections and discover relevant information not to be found anyplace else in the country. Texas remains one of the hottest growth markets for the restaurant industry as a whole, with sales projected to be $52.4 billion by the end of 2016. With over 42,500 eating and drinking establishments in the state, every $1 million spent in Texas restaurants generates an additional 26.3 jobs. Great venue and show organization, intimate aura. 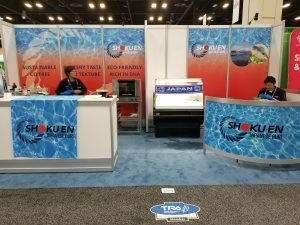 Good to get a feel for the San Antonio market and potential opportunities for introducing Shoku En Buri as a seafood option. 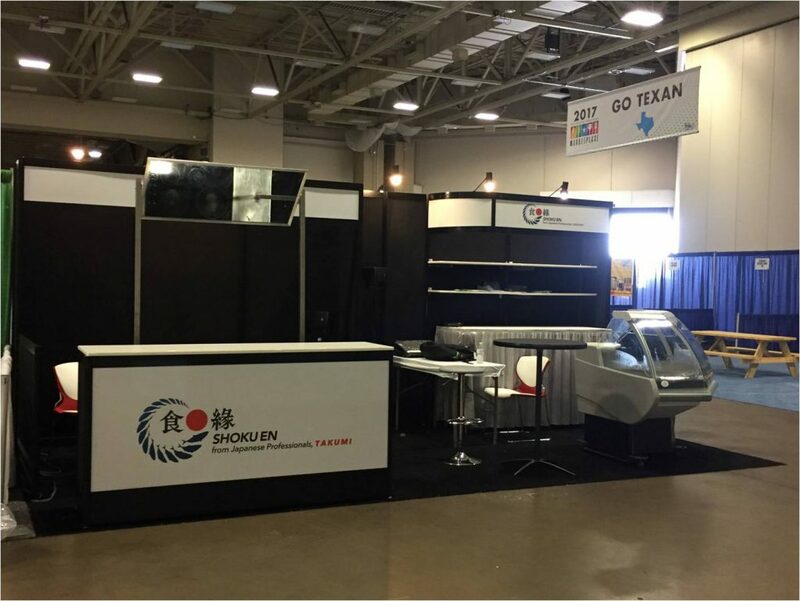 Shoku En Participate in TRA Marketplace held on July 9 and 10 in Dallas. The exhibition was sponsored by Texas Restaurant Association, the 80-year-old restaurant organization leading $52billion Texas market. 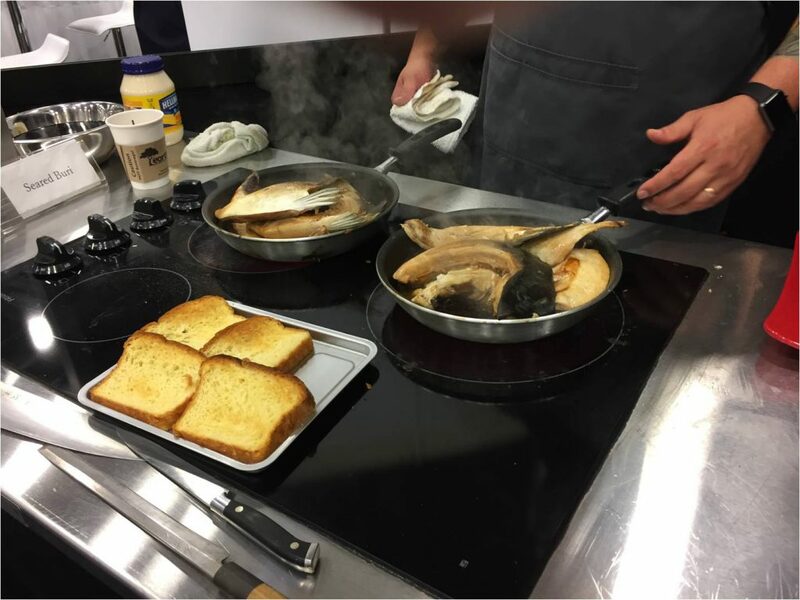 The Shoku En demonstrated a few creative menus for tasting with the assistance of Chef Luck and Chef Rivera of Restaurant IV in Colorado Springs, CO. Because of newness of the product we received various basic inquiries about Buri, Amberjack. Also, what attracted visitors was the Shoku En’s Buri is grown and processed tightly controlled aqua-culture environment. Sustainable production method is the key to the restaurant and the company maintains the system to conserve the limited natural resources. There were hundreds of visitors in the two ay event with nearly 100 inquiries and established large number of contacts. 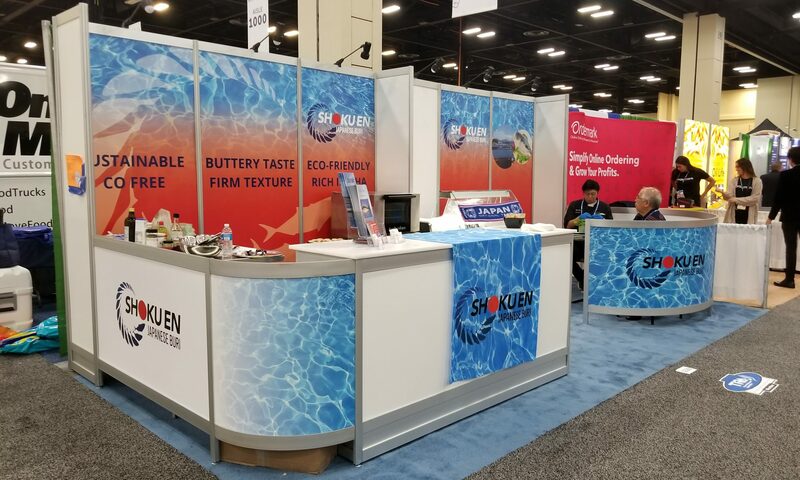 Shoku En is a Japanese Buri processor with HACCP and the company soon will enter into full scale aqua-farming from hatching egg to fed fish then to table at home. As we welcomed the New Year a couple of days ago, I can remember when I was growing up, my mother made sure she bought salted buri to bring in the new year. After all the wonderful foods that was eaten for lunch and dinner, we always ended our day with boiled salted buri and some cha-gayu or tea and rice. 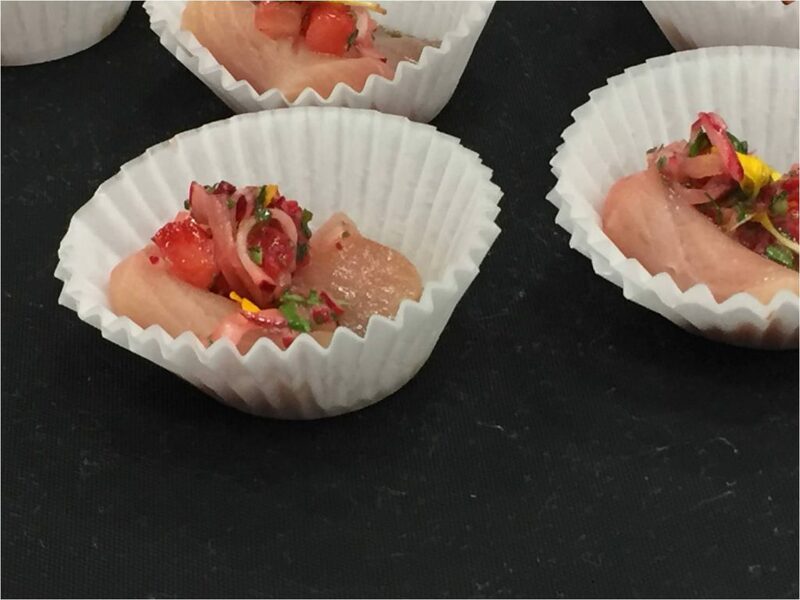 You might know the fish hamachi, well-known in sushi bars, which is farm-raised Japanese amberjack. It is harvested when the fish is about one foot long and 1-2 years old. The flesh is buttery and firm and richer in flavors than its wild counterparts. One the other hand, buri is over three years old and was always thought to be wild hamachi, until Kindai University perfected farm-raised buri. 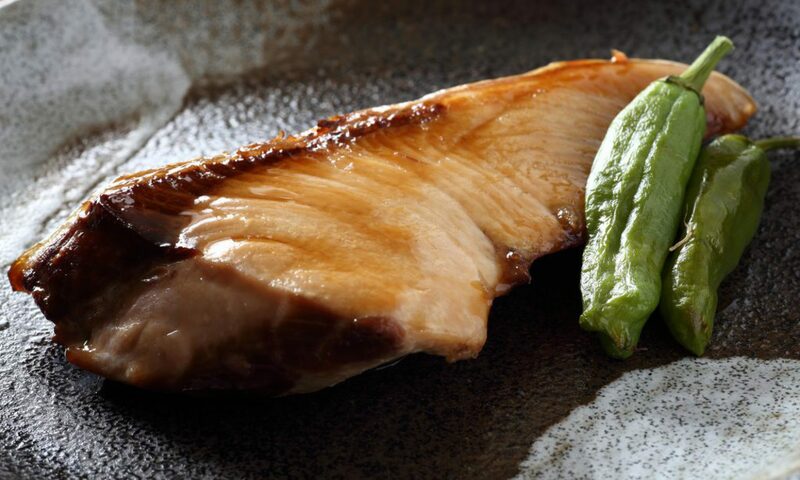 The fat content in buri is high and is available only during the winter months. This is why buri is traditionally eaten at New Year’s Day. Kona Kampachi is in the same family as buri and hamachi, and is also called Hirenaga kanpachi. 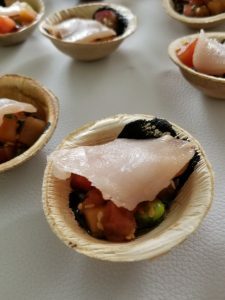 Similar to our kahala both hamachi and Kona Kampachi must be farm-raised as in the wild there are parasites that make them not suitable to eat as sashimi. The fat content of buri is 21.7 percent, 1.2 times higher than that of other fish. The unsaturated fat becomes liquid at room temperature, making buri’s have a silky texture. 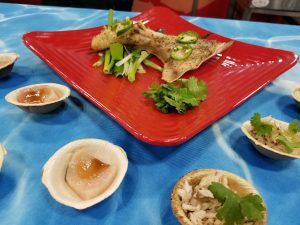 Shokuen Company of Japan featured buri at the National Restaurant Association Show last May in Chicago and surveyed tasters. 94 percent said, “The buri is delicious!” 88 percent said, “The buri didn’t smell fishy at all!” and many commented that buri was “creamy,” “silky,” smooth,” and “impressive.” Shokuen brought with them top Japanese chefs to serve buri sashimi, seared buri, marinated buri, buri teriyaki, buri cutlet, buri risotto, and buri soup. Buri’s firm, fatty meat lends itself to cooking at a variety of temperatures. Japan is very progressive in farming fish, especially those that are becoming endangered. Kindai University assisted Shoku En Company in developing superior techniques for implementing a low-fish meal feel; a better blood removal method; anti-oxidation film process for distribution and a proven 3D freezing method. 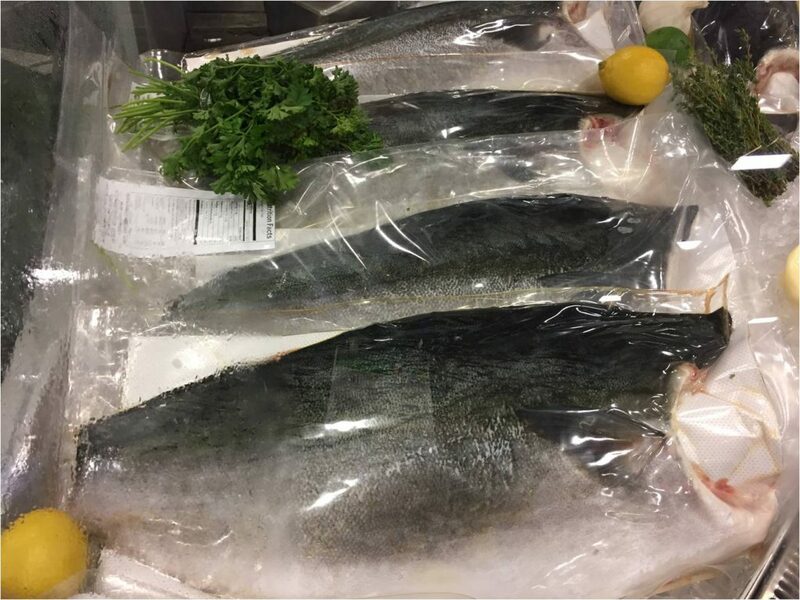 Through Kindai University’s assistance, Shoku En is able to ship frozen buri that thaws out like fresh fish. In fact, Shoku En Inc. Ltd. was established in May 2013 with the assistance of Kindai University, using the practice (?) of “Takumi” or artisanship apprenticeship. Kindai University has the know-how and is known around the world for its success in utilizing the full-cycle aquaculture to raise blue-fin tuna. Shoku En received financial support from the city of Shingu, equity from the Agriculture, Forestry and Fisheries Fund, and funding from the Japan Finance Corporation as well as grants from the Ministry of Agriculture, Forestry and Fisheries of Japan and Wakayama Prefecture. In fact, Shoku E’s CEO, Masahiko Ariji is also a Professor, Laboratory of Strategies for Fisheries and Food, Institute for World Economy at Kindai University. 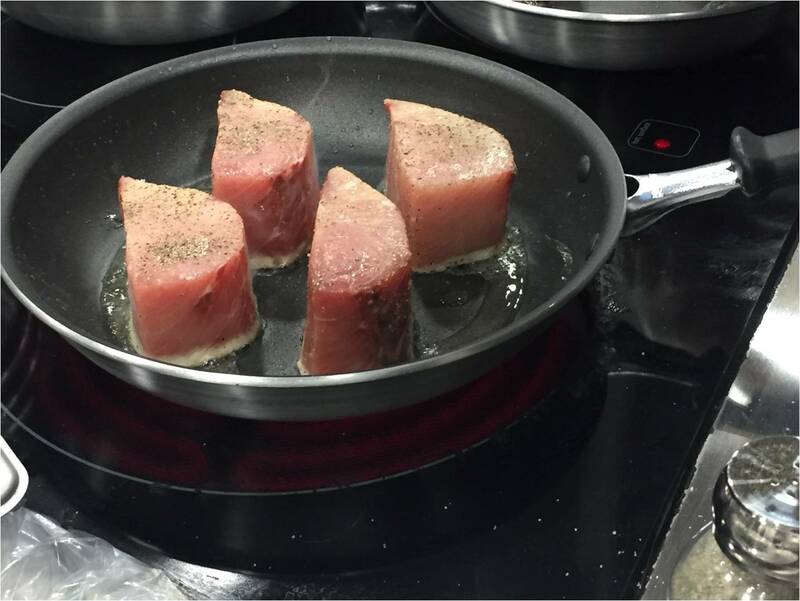 Here a couple of recipes for buri that work well for this fatty fish. Peel and slice ginger thinly. Cut green onions into 2 inch lengths. Blend fish fillets in boiling water for a couple of seconds (this removes undesirable fishy smells) Immediately transfer to ice water. Remove after cooled, and pat dry with a paper towel. In a medium pot, put water, sake, soy sauce, mirin, and sugar, and let them boil. Sdd ginger, green onions, and fish into the pot. Place parchment paper over the fish, and cook about q0 minutes. Place piece of konbu in hot water and soak until soft, about one minute. Drain and set aside. Sear one piece of fish in oil in a skillet over high heat until brown, about 2 minutes per side. Place daikon in saucepan, add enough water to cover, and bring to a boil over medium-high heat. Remove from heat and drain. Place package of Dashi-No-Moto® in 2 cups hot water, add sake, soy sauce, and mirin. Line saucepan with konbu, add daikon in a single layer, and pour in dashi mixture. Lay seared fish on daikon and fold konbu over it. Cover and cook over medium-high heat until stem seeps from under lid. Reduce heat to low and cook, adding water as needed, until daikon is very tender, about 3 hours. Discard konbu and cooked fish and sear remaining fish in oil over high heat until brown, 2 minutes per side. Place 1-2 daikon rounds in one of six serving bowls, add broth, flake fish on top.